New Delhi, Nov 16: The Delhi High Court on Thursday allowed Airtel Half Marathon to be held as scheduled on November 19 after the organisers assured the court that they were ready to deal with medical emergencies. 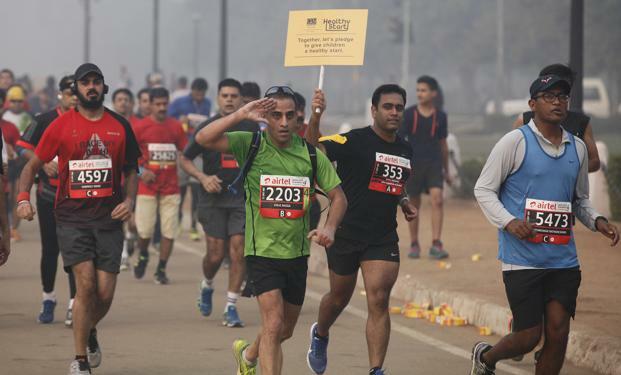 A division bench of Justice Ravindra Bhat and Justice Sanjeev Sachdeva was informed by the organisers that they have put in a refund policy for those participant who do not wish to participate in the marathon in the wake of deteriorating air quality in Delhi. The court was informed that the organisers have made arrangements for two medical camps, 100 nurses, 75 doctors, and a local hospital in case of medical emergency. The court's order came during a hearing on a letter from the Indian Medical Association (IMA) urging that the marathon be postponed due to poor air quality. The air quality is extremely poor and it would be unsafe to continue with the marathon, the IMA has said in its letter and urged to cancel or postpone the marathon to a later date when the air quality improves. IMA President K.K. Aggarwal has written a letter to Delhi Chief Minister Arvind Kejriwal, Deputy Chief Minister Manish Sisodia and and Chief Justice of Delhi High Court for postponement of the Half Marathon.